FIBER SOURCE: 20w (Available 30W and 50W) - Equiped with a german Brand Galvo Scannerd. 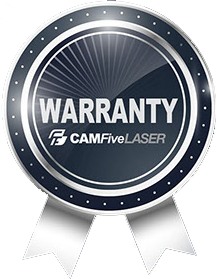 CAMFive Laser manufactures the most precise and fastest rotary systems. 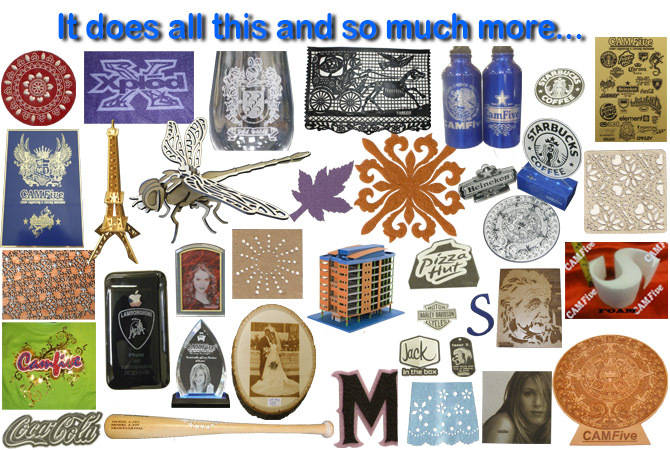 We offer devices to engrave different objects and sizes, from a small cup to a professional baseball bat. Our Motorized digitally controlled chuck rotary is the best to clamp onto objects less that 6” diameter and offers great precision, specially recommended for detailed etching like pens, drum sticks, glass, YETI cups, among others. 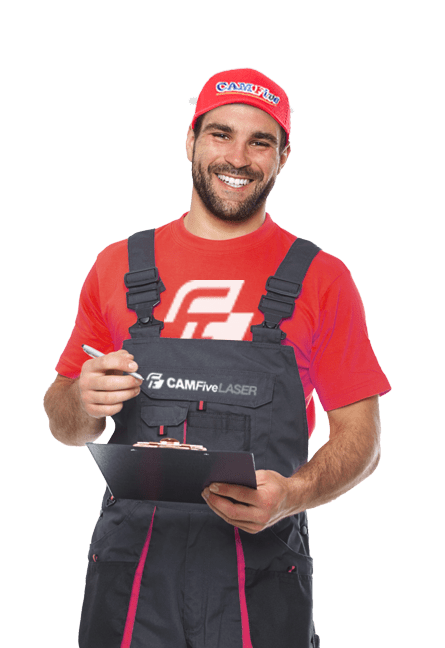 CAMFive Laser manufactures in Germany special galvo lenses for fiber marker machines, they are specially designed to resist high temperatures, have a longer life span and deliver high quality results. We carry different marking areas 4.3"x4.3", 6.8"x 6.8" and 11.8"x 11.8". A Voltage regulator is important to protect the laser machine’s electrical components and sensitive electronics from high electrical peaks. Standard shipping varies between 7 to 12 business days and requires a loading dock or a fork lift. Special shipping applies for residential, lift gate or guaranteed date shipping. For other services and international please contact our offices. Our FM20S fiber laser series can mark metals and nonmetal materials at a high speed and resolution. It is equipped with core optical devices such as a CAMFive fiber laser source, galvo system, a high-speed full digital marking control card and powerful PC software. It not only improves adaptability and maintainability but also reduces the operational cost giving you a stable system without having to invest in consumables such as CO2 laser tubes or engraving bits. Suitable for different industries such as electronics, jewelry, lighting, packing, medicine, metal mechanic, automotive, footwear, clothing, construction and many more. Our lasers have been built under our CNC (Computerized Numerical Control) standards & tolerances, using strict manufacturing processes that guarantee maximum stability and minimum wear and tear of its components throughout its lifetime. Our machines can operate 24/7. It offers a stable and precise drive system with a Japanese brand displacement axle and accurate and fast step driving motors. The optical system has a German brand lens that has been optimized for outstanding performance during cutting and engraving on different materials. FRAME DESIGN: Industrial Adaptive Design. Conveyor System Available. DIFFERENT MARKING FINISHES: With our fiber marker machines, you can accomplish different finishes just by changing the speed, power, frequency and focus settings, for example: ETCH, MIRROR and ANNEAL, among others. JAW CHUCK ROTARY ATTACHMENT (Optional): This is ideal for highly-accurate marking of cylindrical objects, when you need to mark at 360 degrees. The chuck rotary features clamps that can hold both items from both the inside and the outside diameter of the cylinder by simply flipping the chuck jaws from standard to wide mode to accommodate larger radius cylinders.This rotary attachment is specially designed to engrave the inner side of a ring. HIGH SPEED GERMAN BRAND GALVO SCANNER: Small size, high speed and excellent stability, requires little to no maintenance with no more flying optics to align. Also includes a manual z-axis to accommodate the focus for different material thickness. GERMAN BRAND LASER LENS: The machines are equipped with a German brand standard lens that covers up to a 6.8”x 6.8” marking field. FIBER LASER SOURCE: Our generator provides a uniform optical power density and stable output optical power and is applicable to highly reflective metal such as Aluminum, copper, gold, silver among others. SECURITY ENCLOSURE DESIGN (Optional): If your factory requires certain high standards of safety and quality or the material is such that it requires extra protection for the operator, this is your solution. CAMFive Laser has developed a cabinet / Safety cover with UV protection, with rough and easy access doors for the operator’s use. The 270 degree windows allow you to see the work in progress at all times. “USB” INTERFACE CONEXION PORTS: USB connection panel. The machine comes with a USB input port for flash drives that allows you to load files into the internal memory and USB/Printer port (connection cable included) to connect it directly to a PC. LASER BEAM FREQUENCY: Our machines have a high definition and marking speed thanks to the speed of the frequency pulse that can go from 20kHz to 80kHz depending on the fiber generator wattage you choose. CONTROL SOFTWARE AND INTERFACE: The Fiber Laser model comes with a computer and the control software already installed in it. This makes it easy to manage various parameters such as power, speed and frequency in order to achieve the desired results. COMPATIBLE FILE FORMAT: Supports almost all the design and picture formats such as, bmp, gif, jpg, ai, oux, cut, dsb, dst, dxf, emd, nc, out, plt, smc and more. SMALLEST LINE POSSIBLE SIZE: With our fiber markers it is possible to make a single line as small as 0.00078 (0.02mm). SMALLEST CHARACTER POSSIBLE SIZE: With our fiber markers it is possible to make very small characters like numbers, symbols or icons up to 0.2mm. CYCLE DUTTY: Our machines can operate 24/7 with minimum downtime, just for periodic scheduled maintenance, depending on the frequency of use, demand of workload, and materials being used. VOLTAGE REGULATOR (Optional): A 2000 VA, 3000 VA or 5000 VA (depending on the model you choose) voltage regulator is provided to protect the laser machine’s electrical components and sensitive electronics. (Ask you advisor if included with your system). MANUALS AND INSTRUCTIONAL VIDEOS: An Installation, Operation and Maintenance Manuals and instructional videos that contains clear explanations of the Installation process and the usage of the software, the control panel and other features. (For machines only). Call Us: FL (407) 851 5525 / CA (626) 855 4515. With the CAMFive Laser engraver and marker you can create and produce unlimited projects in a wide range of industries such as sign and displays making, customization of promotional items, party supplies and fundraisings, sports goods, engraving, trophies and awards engraving, etching on fabric, leather and other textiles, tags and label marking, wood and acrylic etching, among others. CAMFive Laser Engraving, Marking and Etching Machine is your best choice. Working Area 6.8 inch x 6.8 inch (17.5 x 17.5 cm) Available: 4.3 x 4.3" and 11.8 x 11.8"
Control Software For vectors and graphics processing. Graphics Format Supported BMP, JPG, GIF, JPEG, and JPE. Vector format supported ai, cut, dsb, dst, dxf, nc, oux, out, plt, smc, yln, ymd, saw, dat. Connection Port USB (Wireless Option Available). Working Voltage 220V / 110V 50 - 60 Ghz. Operation Temperature 2°C - 30°C (35 °F- 86 °F). Operating humidity 5 - 95% Non condensing. Manuals Installation, Operation and Maintenance (Digital file or printed). In CAMFive LASER we exceed our compromise with our customers. Our most important goal is to fulfill your expectations and needs. 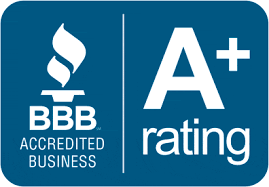 We provide outstanding customer service to satisfy our customer requests. A complete inventory of spare parts for all the LASER CUTTER & ENGRAVER models. Continuous improvements in our service.